Cupboard Love and Sydney Independent Theatre Company present SAY HELLO FIRST developed by Danielle Maas and Joe Kernahan at the Old Fitzroy Theatre. SAY HELLO FIRST is a devised 'verbatim' work (it felt as if it were heavily re-constructed from verbatim, perhaps?) by the two performers, Danielle Maas and Joe Kernahan, directed by Jason Langley. The two artists, "together, armed with a recording device and the urge to know why,(...) set out to interview twenty guys from Dani's life, and on the way discover: The Rules." The rules to courting, modern courting, one presumes. The premise of the work has some familiarity, and I recalled, while watching it, Neil LaBute's 2005 play, SOME GIRL(S) - different, but it rang a bell. Beginning good humouredly, in the format of lightening size sketches, we are mildly entertained with a fairly familiar style of middle-of-the-road sit-com (sketch) comedy. Both the performers are attractive and charming, but have not quite enough of the skill requirements for swift shape shifting either physically, vocally or internally, so all the characters they conjure, are vague approximations of other people, that, mostly, appear to be Ms Maas and Mr Kernahan, pretending for us, to be someone else, in a good natured way. It kind of works, with some fair indulgence from us. There are two halves, one 40 minutes the other, an hour. Late in the second half, maybe, for some, too late in the second half, the writing descends into a kind of serious profile, and we begin to realise that this 'verbatim'-play has been developed to explicate the journey of the 'real' Ms. Maas into a "Heart of Darkness" climax. This research project, this delving into her love-lorn past, now rehearsed, and now being performed, has in this late instant, shattered her with a grim, despairing reality check: a stare into a life of future loneliness. This is, after, all that facetious comedy, a serious piece. Oh, really? (Mr LaBute's play is more disturbing, more exacting, I fondly, remember). Despite my carping (harping), this is a marvellous premise for a work. And Ms Maas follows on, in conceptual daring, from her earlier work COUNTRY MATTERS, if a little, in content and performance style, too depressingly conventional, to provoke us, as she did last time. This work fails at the Old Fitz in its goal mostly because the performers have not the courage to strip down to what their ambitions set out to do. Their director has not been able to tempt them to 'fail gloriously', in getting them to risk, to do something more than an 'act' a truth, AND, rather BE the truth - for that is very exacting and very, very difficult to do, indeed. 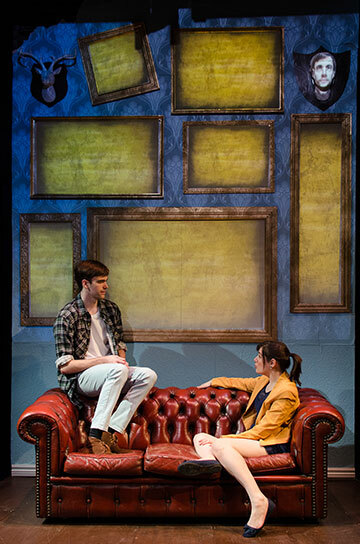 The production values are high, thanks to Sean Minahan, Set and Costume Design, Alex Berlage, Lighting Design, with AV by Stephen Penn. Do go to see this work, as even in this performance format it is, lightly, entertaining, but especially because Ms Maas is at the beginning of the development of a unique talent with a very interesting point-of-view of our world through her own life's patterns, and if she can persist may make a starling contribution to new Australian writing and, possibly, performance. You will remember, "I saw her way, way back in 2013 and she was even interesting then." I saw her, even further back, in September, 2011, and SAY HELLO FIRST, in 2013, still interests me in Ms Maas. Just take it in for its ambitions. So there! SEARCHING FOR MEANING AND FINDING FART JOKES INSTEAD.